SALMON OIL IS FOR EVERY PET PARENT who wants to stop worrying about their pet's health and reduce crippling vet's bills. Good diet and exercise are essential but pets need an extra boost to help with the effects of ageing. Our Salmon Oil gives them that boost. Here's a huge problem you face right now. It's the host of inferior supplements that simply don't work. And, worst of all, other people can't get past this idea. All this can make trying to improve your pet's health a nightmare! But luckily for you, there's now a solution! 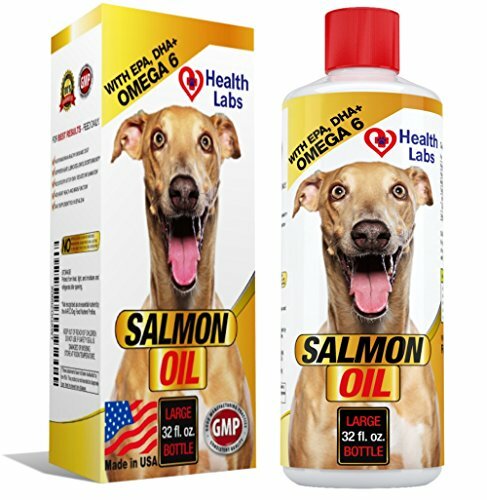 If you're a dog, or cat, parent who really wants to help their pet then "Salmon Oil is the answer you've been looking for! 1. Promotes Healthy Skin and Coat. EPA (10%): anti-inflammatory to help conditions that cause inflammation of the heart, kidneys, skin, & joints. DHA (11%): important in brain & eye development. Giving to pregnant or nursing pets can benefit the babies once they're born. Quality Guaranteed! Manufactured in an FDA approved facility right here in the USA. Pure and Unscented No unnatural scent so your pets breath won't smell like a grizzly bear. Easy to Feed Liquid Easy to add to your pup's daily diet - they won't even know it's there. We wouldn't give our dog, the lovely Bella, anything that didn't work & will never ask you to either. GUARANTEED! The 100% No-Risk Promise. If your fur baby isn't relieved and rejuvenated we will give you your money back! Why wait another day to help your little fur buddy - Order Now! DEPENDABLE! We're a small family owned company who are dog owners ourselves. You can rest assured that we understand the pain you feel; just like the best pet owners do and will give you support every step of the way. We're in this together. REJUVENATE SKIN! Pure Salmon Oil Liquid for Dogs and Cats is a really effective dry skin treatment to reduce shedding. It delivers naturally powerful Omega 3 and 6 fatty acids as a dog ant-itch treatment. Don't let your loved one itch all day; give them relief from constant discomfort. REMARKABLE RESULTS! Our pure Omega 3 repairs, maintains and protects joints helping your loved one move pain-free. Not only that but you'll also improve your cats, or dogs, overall health and longevity. Save money - a 32oz bottle can last up to 1 year! 100% SAFE! Don't gamble with your pet's health. Unlike other sellers, our fish oil supplement for dogs is pure and mercury free. Guaranteed no fillers, binders or preservatives to stop absorption. Your dog will benefit no end from our safe pet supplement. GUARANTEED! The 100% No-Risk Promise. Try it for 30 days and if it doesn't work for you, you'll get your money back! There's absolute no-risk in giving it a try. Even if your pet just doesn't like the flavor, you can get your money back! View More In Fish Oil Supplements. If you have any questions about this product by The Health Labs, contact us by completing and submitting the form below. If you are looking for a specif part number, please include it with your message. ScruffyPet Fish Oil for Dogs and Cats 32 oz Pump Bottle, Super Omega 3 Pet Supplement - Wild Alaskan Salmon Oil - Icelandic Fish Oil - Curcumaine C3 - Vitamin E.